Be advised: the first time you hear the beautiful tones of these Pentatonic Alto wind chimes, you may be rendered breathless. Like all Music of the Spheres products, the Pentatonic Alto is painstakingly calibrated to create the perfect calm. These chimes utilize the notes of the pentatonic scale, which is among the most familiar melodic scales in the world. 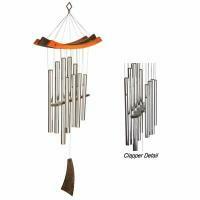 You can keep these chimes outside year-round, too; each one is crafted from powder-coated aluminum alloy tubing that will never rust! 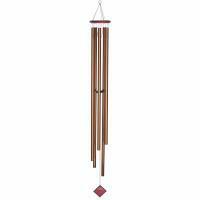 With these peerless wind chimes, your garden will come one step closer to absolute serenity. I bought this item as a gift for a friend's birthday and she just freaked out when she opened it. She has been wanting one for a long time. The sound is so awesome. It sounds like you are hearing music from the heavens. The tones are just amazing! It did not disappoint! This is such a beautiful addition to my favorite outdoor space! We love our new wind chimes. They are beautiful in their simplicity & the tones are gorgeous. They are not overly loud & provide a subtle, soothing musical backdrop. We couldn't be more pleased! I purchased the chimes for a friend living on the other side of the country (Washington state). From what she has told me, she is more than satisfied with the chimes. 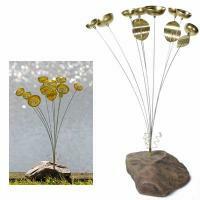 I LOVE these wind chimes! So much so that I have now purchased a set for my parents and for my mother-in-law. 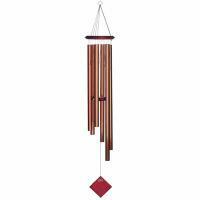 The materials used are high quality and the sound/tone of the chimes is clear and beautiful! It is totally worth the extra $$! It was exactly as described. I loved being able to listen to the different sounds prior to making a purchase. I have been very pleased with my product. I bought this as a gift for my sister. I listened to it on the internet before I bought it, but as my sister lives in another state I have not seen or heard it in person. She says she loves it. It is exactly as described and what I wanted! I bought these as a Christmas present and the chimes were exactly as I hoped they would be. I would definitely recommend purchasing from Picnic World. This is a wonderful wind chime. The tones are in a lower range that is pleasant for us and for our neighbors. Great packaging and shipment from the company. It is a delightful, durable wind chime. My wife has always loved wind chimes, so I decided to buy her one for our anniversary. Now that we have had it for several weeks, I understand that quality comes at a cost, and this chime was well worth it. We have thrown away the other cheap wind chimes. This is a wonderful product, and should last for years. Everyone who hears our new Music of the Spheres wind chime loves it. I love them! The tone is super. These chimes are the ultimate! We love them! Beautiful wind chime! Loved it! The sound quality of these chimes is unsurpassed. I highly recommend them to anyone looking to add beutiful music to their yard, not just noise.